Hearing loss affects around 20 percent of the United States population to some degree, and for many of these people, American Sign Language (ASL) is their main form of communication. Although many hearing individuals can sign ASL fluently, there are still significant, everyday communication struggles for the hearing impaired. A new high-tech glove that can translate ASL to spoken English may soon make life a lot easier for this demographic. The ASL translating glove is the brainchild of Navid Azodi and Thomas Pryor, two University of Washington undergraduate students who recently received the $10,000 Lemelson-MIT Student Prize to help further develop their invention. According to a recent statement, the “SignAloud,” gloves work by recognizing hand gestures that correspond to words and phrases in ASL. The gloves then send the data via Bluetooth to a computer that matches the gesture with the associated word or phrase. Finally, the computer speaks the word or phrase aloud. The SignAloud gloves are not the first ASL-to-verbal language translating device. For example, in 2012 a group of Ukrainian students created a glove called EnableTalk that works in a similar way, using a text-to-speech engine to first translate the ASL signs into text and then convert them into spoken words. Just last year, Hadeel Ayoub from Goldsmiths, University of London, created another type of sign-to-speech glove. This glove works by attaching several sensors to the fingers to record their position and then sending data to a computer using wires sewn into the lining. However, according to the SignAloud co-creator Pryor, there are some meritable differences between SignAloud and past prototypes. According to the World Health Organization, around 360 million people worldwide have some form of disabling hearing loss, and many of these individuals rely on sign language to communicate. ASL is a complete and complicated visual language used primarily by the hearing impaired community in North America. Many may associate ASL as being a form of English, but in reality it is its own grammatically different language. The stages of language acquisition for babies are the same as they are for spoken languages, only difference being that deaf children “babble” with their hands as opposed to their mouths, Mental Floss reported. 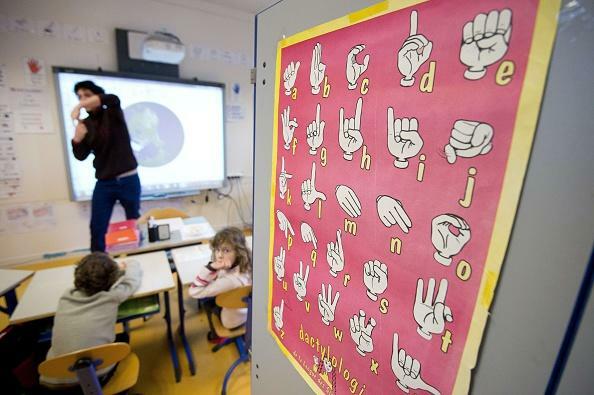 While ASL is often called the fourth most spoken language in the U.S. (although the accuracy of this measurement is debatable), the hearing impaired community still faces many difficulties when interacting with the hearing world. According to co-inventor Azodi, the main purpose of the gloves are to “provide an easy-to-use bridge between native speakers of American Sign Language and the rest of the world,” by allowing the hearing impaired to communicate verbally.